The Wet Mountain Valley Community Foundation was founded in 1999, and since that time has distributed over $4 million to just over 100 nonprofit organizations in Custer County. Grants and gifts have been given to the arts, education, recreation, historic preservation, emergency services, health care, land conservation and related fields of service. The annual Wet Mountain Valley Community Foundation Spirit Campaign is a program of matching gifts awarded by the Community Foundation based on individual donations to nonprofit organizations in Custer County. The Spirit Campaign has generated over $3 million in donations for the local nonprofit community since the campaign’s inception in 2004. It allows residents to focus their donations on nonprofits of their choosing while knowing a matching gift will be awarded by the Community Foundation. In 2017, the Spirit Campaign matched contributions by over 700 individual donors to 70 Custer County nonprofit organizations totaling nearly $400,000 in charitable contributions. The Wet Mountain Valley Community Foundation would like to deeply thank the Anschutz Foundation in providing significant funding for this matching gift effort. The Anschutz Foundations have been partners in the Community Spirit Campaign since the program was initiated. Get more information on how to contribute to the Spirit Campaign. The Wet Mountain Valley Community Foundation strengthens nonprofit organizations and provides donors with charitable giving options. Annual scholarship program for college bound students administered by the Wet Mountain Valley Rotary. A high school grant program giving the students the responsibility of distributing funds to worthy organizations. A $13,000 gift to the community medical center which was used to provide free flu vaccines for more than 1,200 Custer County residents as part of a county-wide pandemic exercise. The Westcliffe Center for the Performing Arts, for the construction of Studio 2 and ongoing operations. Club America WMV to secure matching funds for facility maintenance and continued operations. Silver Cliff Museum for help in restoring the historic building that houses the museum. Supported a project to preserve and develop The Bluff, a park an outdoor events center on the west edge of the Town of Westcliffe. 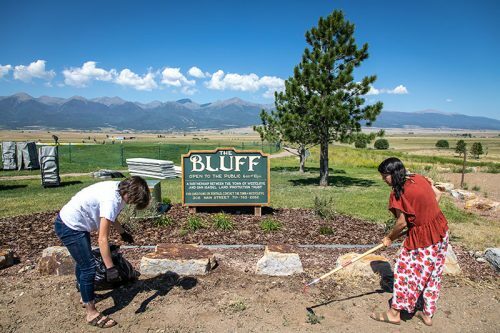 All Aboard Westcliffe to aid in the development of its interpretive center. Learn about the different types of funds we support, explore our local nonprofits, or make a donation today.